Today is brought to you by the letter C. As in “C” how bored I am today, my back is out, I had to go to the “C”hiropractor and I basically have felt like “C”rap all day….so true to my nature, when I am bored and in pain, I cook myself “C”hicken soup….I really am the best. 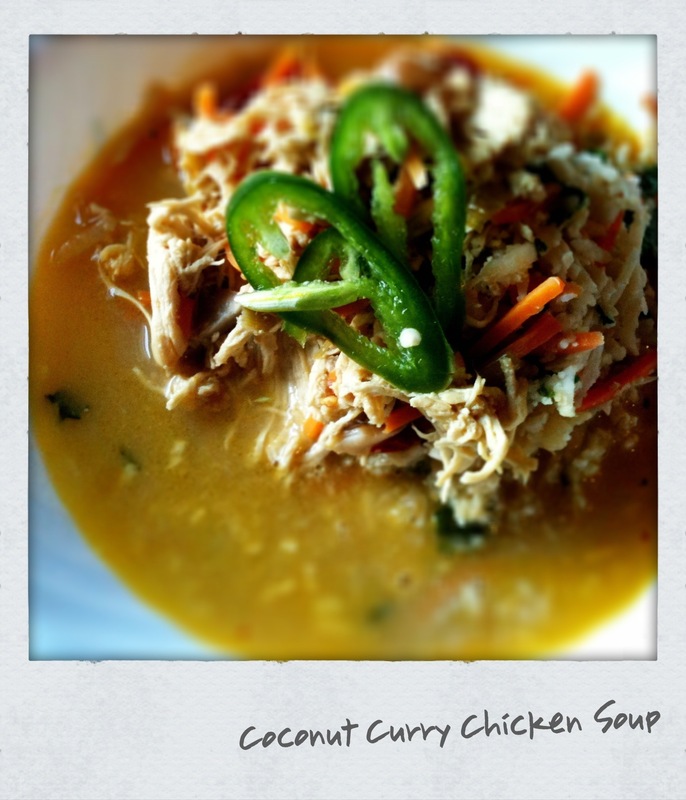 So I bring you “Coconut Curry Chicken Soup with Cauliflower Rice” – yep, this is happening. *you could use fresh lemongrass if you can find it. I never can, but it would be a 2″ piece smashed open. 1. In large stock pot add chicken and stock (or water). On a med-low hit cook chicken through. Approximately 20 minutes. Don’t boil the chicken or it will become quite tough, keep it at a simmer. 2. When chicken is completely cooked, remove and shred or chop. (I use my kitchenaid with paddle attachment to shred the chicken, it works like a charm!) Reserve the chicken stock – you will add it to the soup. Set aside chicken and stock. They will be added in shortly. 3. In your pot heat your fat of choice, I used coconut oil. Add ginger, garlic, lemongrass, bell pepper, green onion, carrots & shitake mushrooms; saute for 3-5 minutes, just long enough to wilt the veggies. Add curry powder. 4. To veggies add 2 cans coconut milk, lime juice, fish sauce, honey, serrano pepper and chicken + reserved stock. Mix everything well. Bring soup to a soft boil, then reduce heat to low and cook about 25-30 minutes. Just long enough to bring all the flavors together! 5. Finish with salt & red pepper flakes to suit your taste buds! This is most easily made if you have a food processor with a grater attachment. If not, you can hand grate, and I wish you all the best in that endeavor, but it’s worth it. I never knew how much I loved cauliflower until I made this!! 1. In a saute pan heat oil over a med-high heat. Add garlic and sweat for a minute or so, try not to brown it. 2. Add cauliflower “rice” & carrots. Mix with the fat and cook through 5-6 minutes. 3. Add soy & teriyaki sauce. Finish with salt tt. **This is an incredibly versatile recipe. You can season any way you like, this is my “fried rice” version and it really suited the soup, you could leave it plain, you could add butter, parmesan cheese and parsley. Oh man, a million different ways to eat this. It’s so delicious and the texture is amazing. Cauliflower rice, who knew! Everyone who ate this raved. Everyone was my mom & dad, but still, I consider that a win.